While I was visiting my family in Brazil this summer, I had a chance to teach my sister how to make her first quilt, from beginning to end. Amongst the patterns her husband her chosen, we picked the one on the left, which was all we would have time for. I had to first learn the technique from the book, which was pretty cool. Then, we assembled all the tools (she had them all as she had been planning on becoming a quilter since I gave her a quilting machine in 2006), read the pattern together, and she proceeded to cut the fabrics. One of her daughters stayed by the ironing table, as I was helping Miriam, my sister, through the steps. Slowly but surely the quilt was coming together. 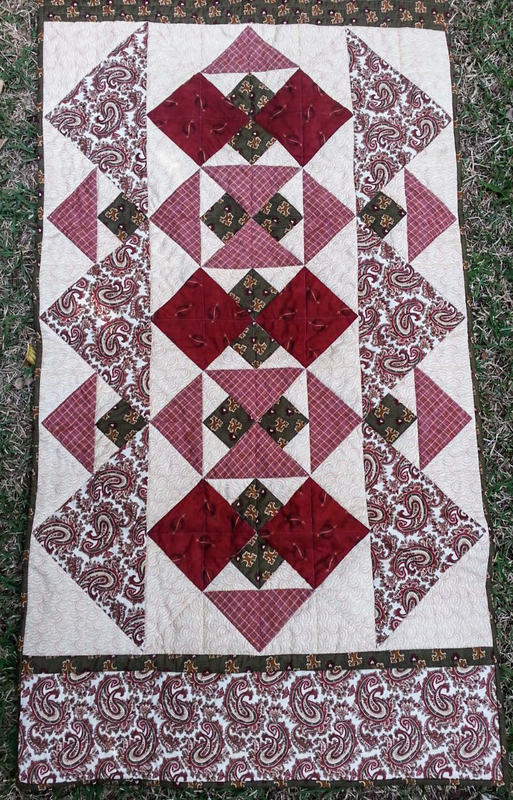 I did not have a chance to teach her the quilting, so I quilted the top before I left Brazil. Can you tell what a wonderful job she did on the picture above? Look at the points! Perfection! At right is the picture of the quilt from Triangle Tricks - One Easy Unit, Dozens of Gorgeous Quilts, by Sally Schneider. 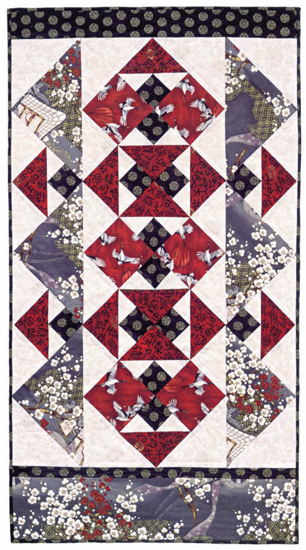 Sally teaches you to make 10 beautiful quilts based on blocks A and B, which look very intricate but are fairly easy to make. The quilt on the book was made with oriental prints but I really liked how the fabrics we chose worked out. Learning by doing is the best way to learn, provided the learner is ready and motivated (which my sister was), the environment is adequate (she had all the tools we needed), the instruction materials are well designed (Martingale books always present clear instructions and diagrams), among other things. If you haven't yet tried this triangle trick technique, you may want to give it a try. When I got back home I immediately ordered it and started working on my own design using the block I saw my sister sew. Take a peek at the left - these are some of my blocks with my fall-themed fabrics. Loving it! Anyway, I am happy I finally had a chance to work with my sister. Although she is very busy with a full-time job and her family, the knowledge she acquired will make it easier for her to work on other projects as she finds the time. How about you, what have you been learning lately? PS: Don't forget to check out Fat Quarter Shop's blog for the National Sew and Quilting Month blog tour for beautiful projects and great interviews. The tour has been happening all this month, so be sure to read about all the participating bloggers and visit their blogs.